The new story of Detroit is, by now, old. Over several decades, a once prosperous automotive mecca fell into disarray for a litany of reasons—white flight, an eroding tax base, crime—and, after filing for bankruptcy in 2013, has since evolved into a sentimental comeback story for the ages. When a new arena for the Detroit Red Wings opens today, it’ll mark the latest entry in that saga, and it amounts to a vacuous bet that’s being placed on sports as a means to economic prosperity. The concept of a publicly-subsidized stadium is far from unusual today. And the deal that was crafted to give the Red Wings’ billionaire owners public funds for the project isn’t particularly egregious, especially when compared to similar arrangements in recent years. The project sits on the north-side of downtown Detroit and it costs $863 million in total, with the city and state collectively paying $324 million of the cost. It’s part of a planned district that includes residential and mixed-use buildings, and it opens tonight with a performance from, unfortunately, Kid Rock. But the fact that it came together during a vulnerable period of Detroit’s history is a sign of how far the city had fallen: after coming to life thanks to the manufacturing boom of the early- to mid-20th Century, by the time Detroit sought the ultimate municipal penance, it was desperate for anything. How could officials turn down several thousand construction jobs even if it required the diversion of tax revenue for years to come? All the studies in the world that illustrate the fallacy of sports stadiums as a way to grow the economy couldn’t stop this deal from happening. What’s surprising is how much Detroit officials have bought into the idea. “The city of Detroit is the only city in America where all four professional sports teams now play in the downtown core,” Detroit’s mayor, Mike Duggan, bragged at a ribbon-cutting ceremony earlier this month. After emerging from bankruptcy, the City of Detroit is writing a remarkable comeback story. One of the most exciting chapters in the City’s rebirth is the imminent completion of a new state of the art arena for the Red Wings, with accompanying retail, office and residential development and the anticipation of the Pistons returning to Detroit after a 40 year hiatus. This miracle has been made possible by hard work, determination and the use of every available development and financing tool. But Duggan’s statement—and the attorneys’ incredible description of the arena as a “miracle”—hints at the belief that the Motor City is doing better by virtue of having four professional sports teams concentrated in the city’s downtown core. This is a lie, of course. The arena is nothing more than an economic facade, a facility that’ll drive residents from the suburbs into downtown Detroit for an evening, only to shove off as soon as a concert or hockey game ends. Maybe they’ll eat at Kid Rock’s new restaurant. Maybe some of them will opt to rent an apartment nearby. But the majority will simply glow to themselves about how nice downtown looks nowadays, hop back in their car, and get on the same highways their parents or grandparents took to leave Detroit for good a half-century ago. The Ilitch family made a name for itself by starting Little Caesars, a pizza business that slings affordable pies and, has for years owned the Detroit Tigers and Detroit Red Wings. Because of the Wings’ previous success and Stanley Cup runs, and the Ilitches’ investment in rehabbing the gorgeous Fox Theatre in downtown Detroit, the family has long maintained good will in the city. But I’ve had a prickly attitude about the new arena for some time. The description of it as filling the hole of a “dead zone” is particularly annoying. Sure, for years, that part of downtown was downtrodden and filled with dilapidated buildings. But many forget much of that property was owned by the Ilitches. Scattered throughout the decay, some bars and businesses stayed afloat—and a few of which are where I met some of the closest friends I have today. Most have since shuttered, their storefronts demolished to make way for the Red Wings’ new home. Still, nothing encapsulates what’s happened as of late in Detroit more than the talent hired by the Ilitch organization to mark the arena’s opening: Kid Rock. Bob Ritchie, Kid Rock’s real name, made a name for himself on poorly-written, annoying music and, lately, is famous for trashing the former NFL quarterback Colin Kaepernick for having the gall to kneel during the National Anthem as a form of protest against police brutality. He also has a colorful past of proudly displaying the Confederate flag at shows as a sign, according to him, of American pride. Despite those accolades, Rock considers himself a premiere Detroit booster, something he reiterated in a rambling Facebook post on Monday, in response to protests planned outside the arena for his opening show. Rock is a bizarre pick for the Ilitches to open the doors of the controversial project. To an extent, it makes sense—he’s a musician that caters to the suburban crowd the Ilitches want to lure to the arena district. But Rock unabashedly dog whistles at racists on a regular basis. Why give him, of all people, top billing for the launch of an arena in the heart of Detroit, a city whose population is more than 80 percent black? I had to laugh when I heard Rock was going to open a restaurant next to the arena. Back in 2014, I interviewed the owner of a bar in downtown that first opened in the mid-2000s, right before the bottom of the national economy fell out. The idea of the arena was upsetting, he told me. Why should his tax dollars be used to support the construction of new restaurants that didn’t try to leave a mark in the city when no one else would? That is literally what the deal for the new arena does: tax revenue collected and diverted to the downtown district is being used to support the construction of the project and accompanying businesses. I’m sure it heartened him to learn his first subsidized competition would be from Kid Rock. And now the public may be funding a venue that’ll mark the waning days before Rock becomes Senator Rock. Neat. But Rock also seems to believe the arena is going to bring a wealth of resources to the city. “I am however very disappointed that none of the people, businesses or charities I have so diligently supported in Detroit have had anything to say about all these unfounded attacks from these handful of jackasses and The Detroit Free Press,” Rock wrote in his Facebook post in response to the planned protests and a columnist from the local daily newspaper. He then threatened to divert his philanthropic resources to other, unnamed organizations. “I would however employ that [the protesters] go ahead and make up these losses since they claim to be so good for Detroit and do not want me opening the arena and generating tons of jobs and tax dollars for the city and people I LOVE... IDIOTS! ….. (Has Al Sharpton even paid his back taxes yet? )” Rock wrote. It’s hard to find a better example to cap the resurgence of a downtown Detroit, with momentum driven by largely a small group of individuals like the Ilitch family and Quicken Loans founder Dan Gilbert. “Tons” of permanent jobs won’t be created by the arena. Several hundred, mostly low-paying jobs to handle refreshments and the like, will be—which is fine. It’s not life-altering for Detroit, though. Detroit’s unemployment rate has been halved since the economy imploded in 2008, but it remains at about 8.5 percent—well above the national average. Good-paying jobs exist downtown, but only about 25 percent of jobs offered in the city are held by Detroit residents. Over the last several decades, auto factories have shuttered, only one General Motors plant on the border of Hamtramck remains. A big selling point of the arena was that 51 percent of construction jobs were supposed to be filled with Detroit residents. Contractors have been fined about $2.9 million, however; roughly 25 percent of total hours at the site were handled by Detroiters between April 2015 and March 2017, the Detroit News recently reported. 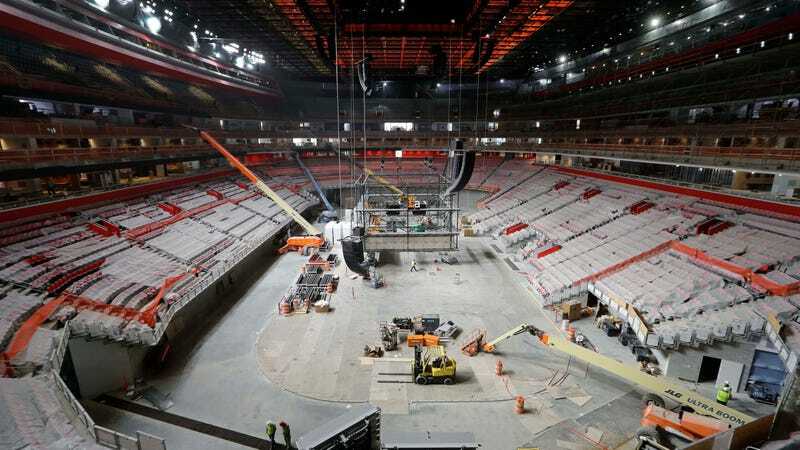 When the arena opens, Detroit will net some additional income taxes generated by the arena. And the new arena, officials say, will serve as a bridge between downtown and the bustling Midtown district—that is, if you believe a crush of traffic on event nights won’t inhibit the flow of foot traffic around the area. Though it’s now a lost cause, the economic merits of the deal should be memorialized on the day Kid Rock marks the culmination of a “miracle” that magically transpired to subsidize professional sports in Detroit. Imagine you’re staring at a map of Detroit. Now draw a box around the city’s downtown. The box you created represents the Detroit Downtown Development Authority. The DDA functions by capturing tax dollars generated by property owners within the box—revenue that would otherwise go to Detroit, the city’s school district, the state of Michigan, the library system, and more. Before the arena deal was crafted, most of the revenue captured within the box was, in the coming years, set to start flowing again to those taxing entities. It amounts to tens of millions of dollars annually. To a broke city, it isn’t chump change. In approving the arena project, however, the city and state issued bonds that required the DDA to continue capturing those funds. Rather than finally returning that money to its original destination, that date was pushed off decades, to 2045. When the Pistons signed on to the deal, it was pushed off again, to the mid-2050s. That is to say the deal literally requires the city and school district to divert tax revenue for the foreseeable future. Any suggestion otherwise is disingenuous or simply banks on the absurd complexity of stadium financing deals. It amounted to a $324 million shrug. When you talk about an arena … [and] if you think about the economic impact from Detroit’s point of view, we’re simply changing the locus of play, and the locus of … some spending. So, the idea that this, somehow, is going to add something significant to metropolitan Detroit’s economy, I think, defies common sense. That’s the dumb secret of the stadium scam. Everyone knows this. The Ilitches even know the stadium isn’t a permanent fixture of Detroit’s skyline. At most, the Ilitches have said, the arena’s lifespan is 48.5 years. If recent history’s any guide, it’ll probably be demolished sooner; or, perhaps, the Ilitches will ask for additional help down the line to refit the stadium with upgrades. For cities like Detroit that need more investment, the unfortunate reality today is that new, robust manufacturing in the U.S. is an empty promise. The new president can bloviate about it all he wants, but automakers and manufacturers aren’t going to build new factories in droves. But what kind of long-term plan is banking on sports? What does four sports teams playing in downtown Detroit mean for the city beyond a symbol for the region to take pride in? Again, with the boom downtown, it’s hard to see how it solves the city’s ills—the majority of tax revenue generated by arena and the revived downtown district will continue to flow to the DDA. The majority of the jobs in the city’s core aren’t held by Detroiters. It’s a great deal for the Ilitches and, if you believe in it, the DDA. Meanwhile, the rest of the city will have to continue to worry about a crisis of foreclosures, water shutoffs, a school district mired in disarray, and persistent crime—all of which detracts some from considering a permanent move to the city. Detroit, to this day, is getting by on a tight budget, one that’s still restricted to the point that city services can’t be drastically improved in short order. So here’s what I think will happen: the arena will fortify the DDA for the next 30 years. Downtown will thrive, but the rest of the city’s going to continue hobbling along from year-to-year—hoping to capitalize on the next corporate grift, but ultimately becoming a place that exists with a stark divide between the neighborhoods and downtown. Sure, Detroit has stabilized pockets and they’ll continue to be just fine. But until a genuine fix for the city’s school district is found—one plan has been put into action, but it’s almost certainly not going to alleviate the problems at hand—and public services demonstrate a marked improvement, against that backdrop, there’s no way to square the purported benefits of the new arena districts with the little tangible effect it’ll bring citywide. If you’re a sucker and believe the city’s going to receive any benefit beyond the sentimental image of packed downtown streets—or you simply don’t care to come to grips with the reality of the situation—just consider that $324 million figure. The local, state and federal government will end up spending that much to move the Red Wings a few blocks away from its previous home, Joe Louis Arena. That’s what makes the argument in support of the stadium—that it’s going to bring flocks of people downtown—so unbelievable. Those people were already downtown. You paid $324 million to change the locus of play from one part of downtown Detroit to another. Well done. Peel away all the convoluted details of how it happened, that’s the plain truth of it all. When the city was at its lowest point, officials conspired with a billionaire’s organization to meticulously craft a deal that makes the public subsidize a new sports arena for decades to come. The arena won’t fix Detroit’s schools, it won’t stanch the crush of foreclosures, it won’t make Detroiters better off—it won’t even play a supporting role in a hypothetical scenario where Detroit does turn around to the benefit of all of its residents. Earlier this year, a survey by the Federal Reserve Bank of St. Louis found that 86 percent of economists agreed with the findings of Noll and Zimbalist way back in 1997. Nobody ever heeded their advice. So I’m confident that, before I die, the Ilitch family—or some professional sports team in town—is going to eventually come groveling to Detroit officials for more money. If you’re that much of a sucker, you’re going to buy-in to the idea that it’s the correct decision to give it to them—that the Motor City, a place synonymous with the auto industry itself, will be transformed and revived to bring back prosperity for all through anchor institutions like a hockey arena. It won’t.